A man found dead from a suicide is the "reason and cause" for a large vegetation fire that erupted last weekend in Monterey County, the Monterey County Sheriff's Office announced Wednesday. The Tassajara Fire that has scorched 1,086 acres started around 3 p.m. Saturday off of Tassajara and Carmel Valley roads, Cal Fire officials said. 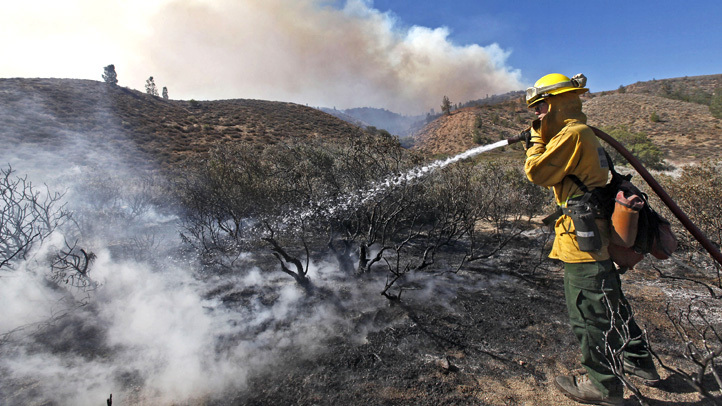 It was 81 percent contained as of Wednesday morning, according to Cal Fire. The man's body was found just outside a car in the fire area over the weekend and it appeared he died from a suicide, officials said. There are 761 firefighters working to contain the blaze, which has destroyed 12 homes and eight outbuildings and damaged another home, Cal Fire officials said. Crews are conducting mop up operations and putting out any hot spots, according to Cal Fire. The onshore flow Tuesday night and Wednesday morning have helped fire crews gain control over the fire, Cal Fire officials said. Power has returned to some areas impacted by the fire and PG&E personnel is working to restore service for the remaining customers, according to fire officials. Evacuations are still in place in the fire perimeter on Tassajara Road and Cachagua Road, Cal Fire officials said. Road closures remain in place at Cachagua Road at Madrone Road, Poppy Tree Lane at Buckeye Road, Tassajara Road east of Buckeye Road and Tassajara Road south of East Carmel Valley Road, county emergency services officials said. One-way traffic control is in effect on East Carmel Valley Road south of Tassajara Road because of fire equipment obstructing the road, county emergency services officials said. Toro Park is closed because it is being used as a fire base camp for crews battling the fire, according to the county's parks website. The Monterey County Sheriff's Office, California Highway Patrol, Cachagua Fire Protection District and Society for the Prevention of Cruelty to Animals for Monterey County are among many organizations working in response to the fire. The county will host a meeting at 6 p.m. Wednesday for people impacted by the fire at the Cachagua General Store located at 18840 Cachagua Road in Carmel Valley.